The mission of the Soyuz TMA-6 spacecraft (Mission 10S) in the spring of 2005 had a goal of delivering and returning the 11th long-duration crew to the International Space Station. 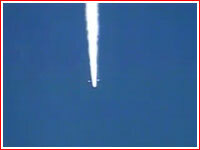 The launch was scheduled for April 15, 2005. 2005 Feb. 16: Soyuz TMA-6 left its manufacturing and testing facilities in Korolev onboard a special train, at night from February 11 to 12. 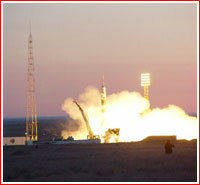 It arrived to Baikonur Cosmodrome on February 16, 2005. 2005 Feb. 17: Test personnel at Site 254 in Baikonur conducted final assembly and checkout of crucial interfaces of the Soyuz TMA-6 and its ground support system, during which the spacecraft was literally "folded" in half along its vertical axis between the reentry capsule and service module. 2005 April 3: Main and backup crews of the Soyuz TMA-6 spacecraft arrived to Baikonur for familiarization training with the actual spacecraft, which took place next day at Site 254. 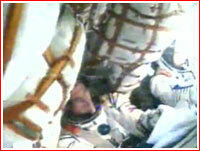 The crews also tried on their safety spacesuits. 2005 April 5: At Site 112, test personnel of the Baikonur branch of TsSKB Progress conducted check outs of the Emergency Escape System, SAS, for the Soyuz TMA-6 spacecraft. 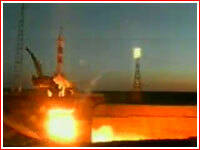 During the night, the Soyuz TMA-6 itself was transported from Site 254 to the fueling station at Site 31. A day later, the spacecraft was moved back to Site 254 for final tests. 2005 April 7: The Soyuz TMA-6 was mated with a rocket adapter, connecting it to the third stage of the Soyuz launch vehicle. Next day, officials conducted final review of the spacecraft and it was covered with a payload fairing. 2005 April 13: In accordance with the long tradition, at 7 a.m. in the morning local time, the launch vehicle with the Soyuz TMA-6 spacecraft was rolled out from the assembly building to the launch pad. 2005 April 15: The Soyuz TMA-6 spacecraft, carrying the 11th long-duration crew to the International Space Station, ISS, reached orbit after a successful early-dawn launch from Site 1 at Baikonur Cosmodrome, Kazakhstan. The Soyuz rocket blasted off at 04:46 Moscow Time on April 15, 2005, carrying Russian cosmonaut Sergei Krikalev, NASA astronaut John Phillips of Expedition 11 and Italian astronaut Roberto Vittori, representing European Space Agency, ESA. After the Soyuz had entered orbit, Russian flight controllers reported the spacecraft's solar arrays had deployed as scheduled, and that all appeared normal. Expedition 11's Krikalev and Phillips will spend about six months aboard the Space Station. Vittori will spend almost eight days on the station, conducting scientific experiments, and return to Earth with the Expedition 10 crew. That crew, Commander Leroy Chiao and Cosmonaut Salizhan Sharipov, has been on the Station since October. The highlight of Expedition 11 should be the arrival of the Space Shuttle Discovery, which is scheduled to return to flight for the first time since the Columbia accident in February 2003. Two spacewalks -- one from the Russian segment and one from the US segment of the station -- are also scheduled for Expedition 11. Finally, the crew should receive and unload two Progress cargo ships. 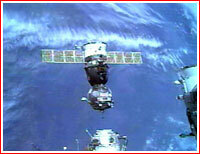 2005 April 16: The Soyuz TMA-6 docked with the Space Station in automated mode at 10:19 p.m. EDT April 16, 2005, just a minute later than the originally scheduled time. Crewmembers opened hatches between the International Space Station and the newly arrived Soyuz at 12:45 a.m. EDT on April 17 to begin almost eight days of joint operations. 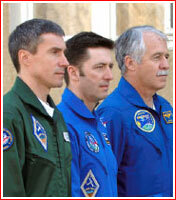 Expedition 11's Krikalev and Phillips spent 179 days in orbit. Vittori spent eight days on the station, conducting scientific experiments, and returned to Earth with the Expedition 10 crew. 2005 Oct. 11: The Soyuz TMA-6, carrying the 11th long-duration crew and space tourist Gregory Olsen, undocked from the ISS as planned at 01:49 Moscow Time. It successfully landed on October 11, 2005, at 05:09 Moscow Time (01:09 GMT) 58 kilometers north-east of town of Arkalyk in Kazakhstan.